ONLY THE MAIN MANAGER ON EACH ACCOUNT CAN ADD & SET MANAGERS – and MAIN MANAGER PERMISSIONS CAN CHANGE TO SIGN IN FOR ALL OTHER MANAGERS. 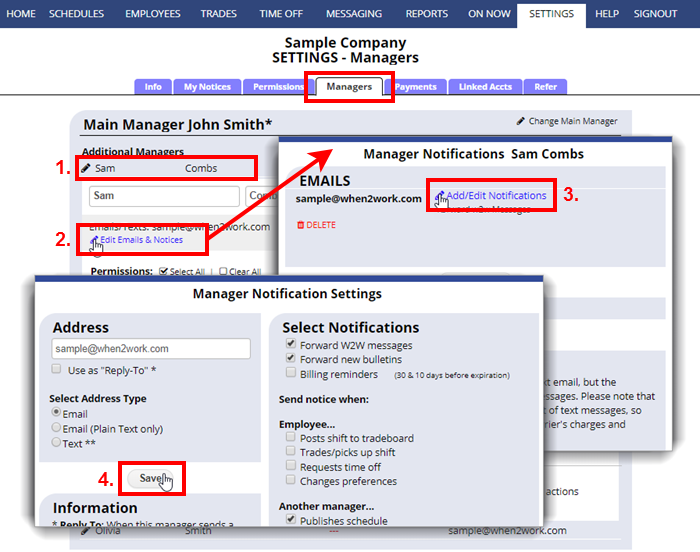 Each WhenToWork account has one Main Manager (the manager who created the account) who can add/edit additional managers. The Main Manager will find the Add/Edit Managers page under Settings. Each manager has a unique manager username and password (IN ADDITION TO any username & password they may have to sign in as an employee) and normally each manager would set up their own Manager Email Notifications. Check off whether it is acceptable to use this email as the “reply to” address for forwarded messages.